Follow this link for Recycled Newspaper Potting Pots. This blog will provide step-by-step directions for making this wonderful money saving potting solution. Every spring I spend my tiny gardening budget purchasing little pots for planting seeds to transplant later when my soil warms. Never again! I will be recycling newsprint and at the same time creating a more efficient transplanting system. When your plants are ready for the garden the entire paper pot is planted with no damage to the seedling. 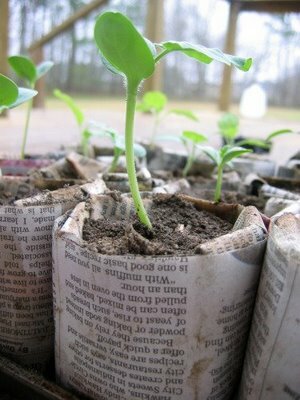 The paper is biodegradable and actually good for the soil. Yes, I have already started planning and purchasing for spring planting. I’ve created a layout for several new planting areas in my yard and for container gardening on my patio and deck. I plan one of the largest, most productive and most cost effective vegetable gardens I’ve ever planted and this will be my seventh season. The cost of supplies has increased just as everything else in this economy, so to make my produce as cost effective as possible, I’m always looking for cost cutting ideas. This one is definitely one I will be using right away. I can make them now and have them ready as soon as it’s time to plant my seeds. I won’t be buying pots of plants this season either. I’ve purchased a supply of heirloom seeds that can provide my seeds for years to come, simply by saving seeds from my plants. By-the-way, you can’t do this with seeds that aren’t certified and guaranteed heirloom seeds. Thanks to the Cottage Hill blog for this and other great ideas! Categories: GARDENING | Tags: cabbage, container gardening, gardening, gardens, planting, plants, potatoes, pots, potting, potting soil, seedlings, seeds, soil, tomatoes, transplant, transplants, vegetables | Permalink.